The Madlyn Borelli Multiple Sclerosis Center at Nyack Hospital was officially dedicated Oct. 14. 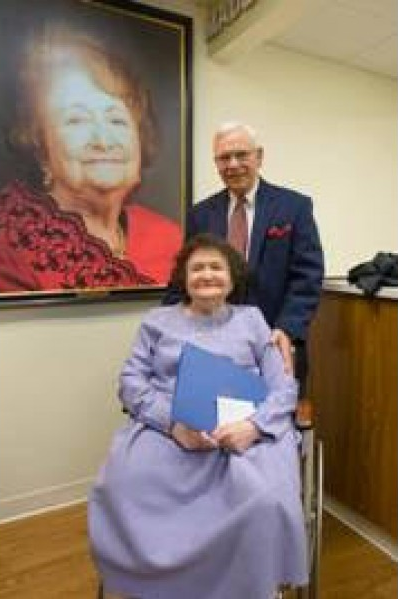 About 100 guests attended the event, which included tours of the facility and an unveiling of a portrait of Madelyn Borelli (for whom the center was named) by her husband, Frank Borelli, Sr., a former Hospital trustee and benefactor for the new center. In four short years, Nyack Hospital’s MS Center has seen an impressive growth that has led to providing services for almost 500 patients. Patients come from as far away as the northern most counties of the Hudson Valley to receive care. This substantial growth of the program precipitated the need for a larger facility which was designed and constructed to meet the specific needs of individuals with Multiple Sclerosis. The Center offers five treatment rooms, a private nurse’s station, conference room, three private offices and a spacious waiting area and reception desk. At the dedication, Borelli spoke about how vital it is to provide excellent care for individuals with MS right in our community. He shared the challenges faced when taking his wife into the city for treatment and how local access to comprehensive services makes a tremendous difference to patients. He said he and his wife were very pleased to support the expansion and modernization of the MS Center which will help more individuals and incorporate a clinical research program in the near future. Dr. Jai Perumal, Director of the Center, gave thanks to the Borelli family and all who have supported the center. She said “We have built this program from the ground up and it is so uplifting to see the progress made as we look forward to continued growth and expansion in the future.” Dr. Perumal also shared that they are making preparations for the Center to begin participating in clinical research programs. The Madlyn Borelli Multiple Sclerosis Center at Nyack Hospital has been designated a Center for Comprehensive MS Care as recognized by the National MS Society’s Partners in MS Care program. The Society’s designation of Center for Comprehensive MS Care recognizes the need for patients to have access to a full array of medical, psycho-social and rehabilitation services to address the varied and often complex issues related to living with MS, a chronic disease. The center focuses on the total care of the patients with MS and facilitates a multifaceted approach involving a variety of specialties and expertise. For more information about the Madlyn Borelli Multiple Sclerosis Center, call 845.348.8880.